There is a lot of news to note regarding energy, environment and politics. This blog attempts to note such things on the assumption knowledge was important. Today it's probably more important to note that assumption is highly questionable. Hopefully I can write entertainingly so as to get readers through to the ridiculous conclusion of this post on sustainability science -ishness, and disposal of nuclear waste. Some very quick background before discussing the fall-out from two reports put out over the past week from bodies attached to the federal Ministry of the Environment and Climate Change. Canada's second Prime Minister Trudeau reportedly hand-picked Marlo Raynolds, a former head of the Pembina Institute (an industrial wind lobbying organization that has historically marketed itself as an environment organization), to be the head of staff for the lawyer, Catherine McKenna, appointed Minister on Environment and Climate Change. It would be hard to find two individuals to better characterize the stereotypical image of an "environmentalist" imagined by the all-important affluent, urban voter. In August 2016 the Minister appointed a panel composed of bureaucrats and lawyers "to review and restore confidence in Canada's environmental and regulatory processes." The "Expert Panel" was headed by Johanne Gélinas, a former Canadian Commissioner of the Environment and Sustainable Development. In 2007 The Toronto Star referred to her as "Environment Czar" in writing of her firing by a Conservative government. The article included, "John Bennett of the Climate Action Network said it was a sad day for the environment." Knowing the personalities is really all one needs to know the conclusions, but since the rejection of expertise is, it seems to me, generally a malady attributed to those on the right skeptical of most apocalyptic claims, it may prove antidotal to review this other tribe's tripping. This past week the Gélinas panel provided the report everybody expected them to - criticizing the processes of the previous government and suggesting more study and consultation, etc. The objects of those processes were pipelines and nuclear projects, making the bodies being judged the National Energy Board (NEB) and the Canadian Nuclear Safety Commission (CNSC). ...We believe that Canadians deserve better and that it is entirely possible to deliver better. ... in our view, assessment processes must move beyond the bio-physical environment to encompass all impacts likely to result from a project, both positive and negative. Therefore, what is now “environmental assessment” should become “impact assessment” (IA). Changing the name of the federal process to impact assessment underscores the shift in thinking necessary to enable practitioners and Canadians to understand the substantive changes being proposed in our Report. We also outline that, as we listened to presenters and read the many submissions presented to us, we came to understand that any new effective assessment process must be governed by four fundamental principles. IA processes must be transparent, inclusive, informed, and meaningful. The current processes are transparent and inclusive - which is a problem in having them perceived as informed and meaningful. Professional agitators are participating specifically to avoid meaning being found through the process. Politics means this review existed solely because the existing process was introduced by a Conservative government, and therefore opposed by the Liberal party that later defeated it. The major problem with the old EA process was it had outcomes the Liberal's allies (tribe) disliked. Additionally, some participants argued that these industry-specific regulatory agencies are more focused on technical issues than they are on the planning process that is fundamental to a thorough IA [Impact Assessment]. Participants felt that issues were not properly being assessed and were being put off to the post-decision regulatory phase. The [Canadian Environmental Assessment Agency], by contrast, was described favourably, largely for not being subject to the same pressures faced by the NEB and CNSC as regulators. Some names I don't often see in my Twitter notifications appeared due to my exchange with Stensil, including John Bennett - who had lamented the firing of this Expert Panel's Gelinas back in 2007. Bennett noted he was "Sierra, Greenpeace, FOE and more" (I don't know if the more includes the Climate Action Network he was identified with in 2007 - or if there was a split with the other member of that group). As expected, he did not answer this question: "Where do you think nuclear energy, and waste is well regulated?" It seems to me it would only be reasonable to test the capability of a panel against a criteria of being trustworthy to those who are capable of accepting the decision of experts. Sierra is the exact opposite: it is a group with a mission to clutter the regulatory system as a tactic to prevent the construction of anything it opposes. Is it reasonable to design a process to appease interveners who have no interest in a legitimate process should it produce an outcome contrary to their position, or other fund-raising assets? I think Bennet was pretending a position when he stated, "CNSC is a regulator - a technical function. EA is socio-economic-environmental function," but it does introduce the idea of social acceptance within the context of sustainability assessment. In my exchange with ShawnPatrick Stencil he showed Dr. Patsy Thompson, of the CNSC, responding to a chairperson's questioning, "Does the CNSC actually have...its own list of sustainability criteria with which to review [environmental assessments]?" "I would say that we don't. Essentially the focus of the CNSC staff assessments really focus on project assessments and whether or not they will meet the provisions of ensuring protection or the environment, the health and safety of the people." The distinction between protecting the environment and health, and "sustainability", isn't an obvious one. My skepticism on the legitimacy of a "sustainability assessment" field resulted in a suggestion to read up the topic with a book that has 5 times as many authors as reviewers. The article is from 2004 - one could be forgiven for thinking Sustainability Assessment is a new-agey science-ish thing. Although there are various international efforts on measuring sustainability, only few of them have an integral approach taking into account environmental, economic and social aspects. In most cases the focus is on one of the three aspects. Although, it could be argued that they could serve supplementary to each other, sustainability is more than an aggregation of the important issues, it is also about their interlinkages and the dynamics developed in a system. This point will be missing if tried to use them supplementary and it is one of the most difficult parts to capture and reflect in measurements. If the indices are poorly constructed, this will provide misleading results. the evaluation process involved could change through time according to the interests of the particular stakeholders involved in the construction of the indicator. Sustainability Assessments are driven by politics. It occurred to me during this research that I may be a sustainability expert - and I know others, which I have written of on this blog. Before I discuss them, I'll note another brash output from the past week attached to the current federal Minister of Environment et. cetera. The Minister of Environment and Climate Change requires that Ontario Power Generation (OPG) identify and consider the effects of alternative locations of the Deep Geologic Repository for Low Level and Intermediate Level Waste project (the Project) that are technically and economically feasible. This is not a sustainability assessement, as the direction omits socially acceptable. the Canadian Environmental Assessment Agency criticizes the utility’s report as inadequate and asks it to try again — much to the delight of project opponents. Of course - anything that delays and adds to costs delights opponents like Sierra. ...a feasibility study for disposing of highly radioactive spent nuclear fuel is currently underway and the assessment agency wants OPG to analyze how the two projects might interact environmentally. The referenced "highly radioactive spent nuclear fuel" deep geologic repository (DGR) is the responsibility of the Nuclear Waste Management Organization (NWMO). The NWMO presents the best example of an organization focused on sustainability assessments; its history and current activities demonstrate the ignorance of the current administration in that same discipline. The greatest barrier to a DGR was, and is, social acceptability. The NWMO was formed by 2002 (again by a Liberal government), and began a site selection process in May 2010 after 2 years of dialogue. That process is ongoing. 13 communities that had expressed an interest in hosting the DGR are no longer under consideration, with 8 remaining locations. The process demands a willing host site: only after a location is deemed willing does the more intense scientific examination of conditions occur. Off the remaining 8 sites in the running to host the DGR, 3 are in the neighbourhood of OPG's Bruce site (South Bruce, Huron-Kinloss and Central Huron), and another has a history with the nuclear industry (Blind River, Elliot Lake and area), and is near Lake Huron. If social criteria is important - as it would be in a sustainability assessment - OPG's logical concentration should be on its Bruce property. The four other areas still under consideration by NWMO are all in Ontario further north (Ignace, White River, Manitouwadge, and Hornepayne). All do require much more transport than the locations where much of the populace is familiar with the industry. The 4-decade long process to site a DGR for highly radioactive waste is ignored by the current minister - and all the noise about sustainability assessment served only to sabotage the existing search for both DGR's. Where public support is viewed as a sustainability criteria the Minister of the Environment just produced a week that signals her disinterest in winning that support. To be clear, if the CEEA is the most trusted precisely because it dithers and solely acts to criticize and delay pretending a shortage of data is responsible for its irresponsibility, how is changing EA to IA going to be meaningful? OPG has one path forward, if it is going to protect ratepayers from wasting money on lawyers and studies to be ignored by the current minister. The first is to by toyed with indefinitely while feigning studying other locations already being examined by the NWMO. The second is to abandon a DGR altogether. With the current political situation preventing social acceptance, the obvious response is to deny there's any need for such a thing. The Bruce DGR plan represents an abrupt departure ... in proposing that Low Level reactor operational wastes be treated in the same manner as High Level used nuclear fuel i.e. burial in a DGR. This is not only an unnecessary and uneconomic plan but it also sets a new and unrealistic standard for Low Level Waste disposal ultimately harmful to Canada’s nuclear industry. Since there's no possibility of this government approving one, lets assume that's true. Some other recent news/studies I'll mention because the above discussion could lead people to think nuclear simply isn't a possibility within any sustainability assessment - and in fact the paper noted above references assessments that would eliminate any institution invested in nuclear power from being considered sustainable. One is a literature review on the subject, self-published by the Energy Innovation Reform Project (EIRP), authored by Jesse Jenkins and Samuel Thernstrom. It looks at a range of studies on deep decarbonization in the electricity sector and tries to extract some lessons. The other is a new paper in the journal Renewable and Sustainable Energy Reviews that boasts “a comprehensive review of the feasibility of 100% renewable-electricity systems.” It is by B.P. Heard, B.W. Brook, T.M.L. Wigley, and C.J.A. Bradshaw, who, it should be noted, are advocates for nuclear power. ...low-carbon dispatchable baseload resources such as nuclear, biomass, hydropower, or CCS, are an indispensible part of any least-cost pathway to deep decarbonization. 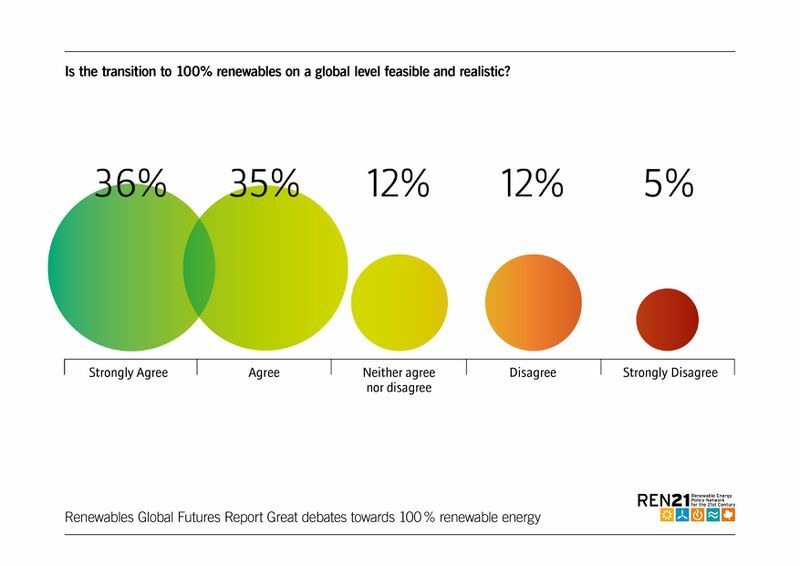 Our assessment of studies proposing 100% renewable-electricity systems reveals that in all individual cases and across the aggregated evidence, the case for feasibility is inadequate for the formation of responsible policy directed at responding to climate change. These two studies are by authors known to be, at the very least, tolerant of nuclear power - and some are strong advocates of it. What jumped out at me is this paper is based on a questionnaire and 1 hour (on average) interviews with "114 experts" in a field. There is no explanation of the selection precedure, and the results are analysed and interpreted by Dr. Sven Teske. Another site notes Teske " used to write similar reports together with the industry lobby groups for Greenpeace (some content has been copied from there). Full steam ahead on renewable energy. Keep nuclear power plants open as long as possible. Do relentless RD&D on carbon-free dispatchable resources, including nuclear. I'll finish with a word for those in Canada's Ministry of the Environment: woke means awake. Don't sleep though another two decades.